Prefer to pay by check? Register online and select “pay by check” then print and mail your confirmation with a your check within 30 days. These courses will be held Thursday August 1, 2019. You can register for these individually or in addition to the main conference. These courses will be held Sunday August 4, 2019. You can register for these individually or in addition to the main conference. NEW FOR 2019! You will work ONE FULL DAY (6:30 am – 6:30 pm) of the DCAC International Fitness Education Conference 2019 and register for classes for a ONE DAY registration on the opposite day! DCAC utilizes the efforts of individuals to assist with the many on-site responsibilities that are required to produce our conference. Staff Assistant positions allow an individual to attend the conference at a reduced cost in exchange for their labor. You do not need to have prior experience nor a fitness industry-related background to be a staff assistant. Staff assistant registrations will be limited to the first 50 people to sign up. Please read and make sure you meet the requirements before registering as a staff assistant. Work schedules cannot be customized around specific sessions. When you are not working, staff assistants attend sessions just like a regular attendee. CEC’s may be earned for both those sessions that you attend in full as well as those for which you are assigned to work. For more information, please contact Jamie Nicholls by emailing jamie@dcacfitness.com or calling (800) DCAC.551. Cancellation/Refund Policy: NO REFUNDS! I understand that if I cannot attend the conference, I may transfer my registration to another individual for a $50.00 processing fee. In the event of a medical emergency or death in the family, I can receive a credit for my registration towards a future DCAC Convention/Event. The credit will be issued, less a $50.00 processing fee. (Both a transfer and a credit require that written notification by postal mail is received by 07/20/19. 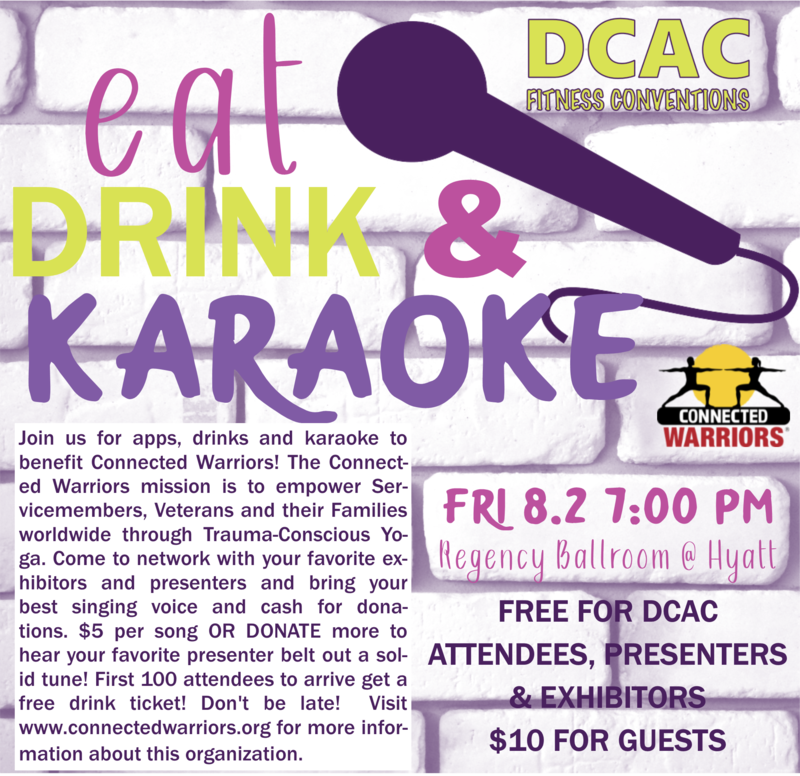 Please mail requests to DCAC Fitness Conventions, 8141 Solitude Lane, Mechanicsville, VA 23111 USA.) Presenters, classes, dates and times are subject to change without notice.